Nicola had her own ideas about school, though it must be confessed that these were entirely taken from the very few school stories that Miss Charters would allow her to read. She had a picture of a place where there were a great many girls and comparatively few lessons, and an august being called the "Head Girl", who was always particularly gracious to newcomers, and whose life the new girl was usually given the opportunity to save. I began my education in the summer term of 1967 at the local state-run County Primary School, a few weeks before my fifth birthday. The original Victorian elementary school had been augmented by a hall which served for assembly place, dining area and gymnasium, and by two "temporary" classrooms in Portakabins. Separate entrances remained for boys and girls (although we never took any notice of these distinctions), and the toilet facilities were still outside in the playground, although these were later modernised. There were six classes, with between thirty and forty children in each. The pupils reflected the social mix of the town, such as it was; only at the age of eleven were the social divisions marked by the schools to which we went on. For now we dressed identically in uniforms of grey skirts or trousers, white blouses or shirts, grey and red striped ties, red cardigans and grey blazers, with red checked gingham dresses for the girls during the summer. The school also included a number of disabled pupils without making any distinction between them and the other pupils. The only real distinction was religious; better-off Catholic children attended the local Convent school instead. My social problems were compounded by my poor health, which meant that I often spent extended periods away from school, and also by my poor eyesight. This latter problem was not realised until I was about seven or eight years old, when I was moved to the back of the classroom and I discovered that I could not read the blackboard. I then became one of only about three children in the school to wear glasses, increasing my victimisation since I was easily identified as vulnerable (it also did little for my self-confidence). My lowest point came when I was made to spend two years in Class Four. By this time I had been put into a class a year ahead of my age, which had solved many of the problems of boredom. But an edict was received from the County Council that all pupils should stay with their own agegroup, and with a summer birthday - which already meant that I was one of the youngest in this group - I had no chance of avoiding it. Consequently I found myself writing exactly the same notes into my exercise books for a second time. To relieve the boredom I developed the habit of reading a novel under the desk during lessons, which was to last until the Sixth Form at my High School. I never did take a great deal of interest in my academic achievements. After I received my first school report I was besieged at the school gate by other pupils who wanted to know what my grades were, but my report had not been shown to me - in fact I was unaware that such a thing existed - and I was bewildered by their questions. Later I knew that I was considered to be one of the most able pupils in the school, but this was hardly of great relevance to us as pupils. We had very different values which placed good looks, fashionable clothes, possessions and sporting prowess far above academic achievement, which was regarded with some suspicion. As I was geeky, unable to afford the latest crazes, bad at sport and already stigmatized as a "lesbian", I did not have a very high opinion of myself. I did, however, enjoy some aspects of school: Music (we had an eccentric headmaster whose chief interest was Music) and Drama - I sang in the choir, and often took a leading role in productions when I was well enough to attend school consistently; Art and Crafts; and Gym (although I hated outdoor games, since I felt the cold very badly and either could not see to play properly, or had to be careful of my glasses). I also enjoyed my last year at school. Our class teacher's chief interests were - unusually - Art and Classical Civilisation, which he combined by reading the Greek myths to us while we painted. My chief bully had left, and I was given a number of responsibilities within the school which I enjoyed, although they seem rather ludicrous in retrospect. (For example, a friend and I served the headmaster's lunch each day before supervising the youngest children's recreation time in their separate play area; this accorded us a number of privileges including an early and better lunch.) 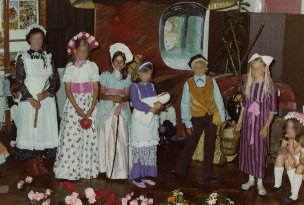 I was in the choir and took a lead part in the school musical production; this also resulted in many escapes from lessons for rehearsals. I suspect that the slacking off of the school's regime during my last two terms at primary school was at least partly due to the selection process which then existed for secondary schools. After we had sat our "11-plus" exam in the spring term to decide to which school we would go on, the primary school seemed to consider its responsibilities at an end. By the time that I reached the age of ten, in 1972, the 11-plus had been largely abolished nationally and the selective school system replaced by comprehensive schools. The old system had become increasingly discredited, and as a small child I recall my mother reassuring me that I would never have to take the 11-plus (having "failed" it herself, she was only too aware of the class and income divisions it perpetuated). However, the Conservative regime running the county's Education Authority retained a number of selective schools and the 11-plus selection process, leaving most of its secondary modern schools to become "comprehensive" without additional teachers or resources. In 1973, the year when I changed schools, the local comprehensive school's curriculum was unchanged from secondary modern days. For example, "Science" was taught as one course rather than being divided into Biology, Physics and Chemistry, despite national examinations being divided in this way. Moreover, the school had been formed by merging two other rural schools, meaning that for the first three years I would have to travel eight miles to one site, transferring at the beginning of the GCE O Level courses to another site closer to home. While my mother originally believed that the comprehensive system would be an improvement, in the circumstances she was very unhappy at the thought of us attending the local school (in the event, none of us did). She came herself from a poor working-class background, had been forced to leave school at the age of sixteen after an inferior education, and in fact was to wait until her fifties before gaining an honours degree in Psychology from the Open University. She was determined that we would have a better chance, and when she realised that I was likely to gain a place at one of the best local state schools, became keen for me to take the 11-plus after all. It was no surprise to anyone when I "passed" and gained a place at the County High School for Girls, some twenty-odd miles away in the market town. 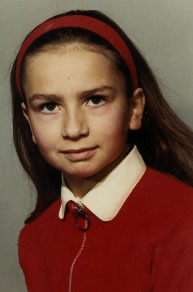 My last weeks at the school were some of my happiest, particularly my birthday party at the beginning of May 1973. I had been most insistent that my friends would scorn anything "childish": we must listen to pop music; and I must wear something fashionable. In the event, though, my friends spurned these entertainments and spent a happy afternoon playing with the toys belonging to my mother's playgroup, to my father's intense amusement. Unfortunately, however, I was to have little to do with my classmates again.